If you’re holding back out of fear that your skills aren’t honed enough to turn dreams into reality, relax! Even women who lack degrees or high-priced “career skills” will find there are plenty of options for launching lucrative home-based businesses. It’s also possible to land actual on-staff jobs working for others out of a home office. Telecommuting is becoming more common than you might realize. You might even be able to sign on as a contract worker or freelancer with companies all over the world. In this book, we’ll discuss the things you’ll need to consider to have a successful go at it. There are some ways to tell if working at home really suits your style and some benefits and pitfalls that are smart to explore before moving full steam ahead to start an at-home career. Although obstacles will present themselves – especially for busy mothers with hectic schedules – there are ways to squash almost all of them. There are techniques, tips and ideas for facing adversity head on and winning that can help put you on the road to success. One of the keys to success with an at-home venture is selecting the right field to work in. The opportunities out there can be a little staggering, however. Exploring all of the options carefully and how they might fit into personal lifestyle should be a top priority before selecting a path to take. It doesn’t matter whether you’re planning to become an entrepreneur of some sort or you want to work on a freelance basis, there are a few nuts and bolts items you’ll also want to consider, as well. From obtaining any necessary training and finding jobs to how to set up a home office, we’ll discuss what you need to know to turn your work-at-home dreams into reality. You love the idea of being able to work at home and relish the notion of spending more time with the family, but you’re just not sure this is the right road for you. Don’t sweat it – you are not alone in your doubts. Just about every woman who has ever launched a successful at-home career has faced them. Still, it’s smart to be sure. Working at home does require a lot of dedication, discipline and patience. It’s just not for everyone, and that is perfectly okay. 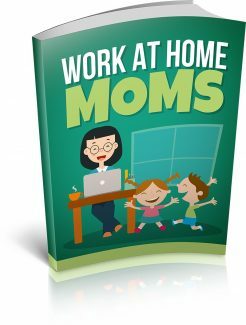 There are a few things that should be carefully considered if you’re intending to become a work at home mom. Even if you are a stay at home mom, adding a career into the mix can change things a bit. To make sure you’re going in a good direction for you, it is important to review such things as finances, family support and your ability to cope with the prospect of working at home. Some moms thrive in this situation, but others wither. If you’re planning on leaving a paying job to work at home, having a good handle on your finances will be a must. In most cases, it will take some time to build up a business or freelance venture enough to replace a workaday job. Beyond the capital needed to launch the business, you will also need a nest egg to cover the startup period. • Your monthly bills Understand just how big your contribution is to the family’s budget on a monthly basis. Make sure to have figure covered for at least a few months. Three months can do the trick, but it’s a conservative (and safer) choice to shoot for six to even 12. Keep these figures separate from what you’ll need to give your business venture a fighting chance as success, as well. • Anticipated extra expenses Establishing a business at home can take a little upfront capital. Beyond what is needed to cover the family, you’ll also want money for equipment, marketing, licensing and so on. A small business loan might work in some cases, but for many at-home operations, you’ll be on your own with startup costs. • Projected “red period” While business plans might not always pan out exactly on schedule, have a good understanding of your particular venture’s anticipated period of running in the red. You’ll want to make sure you have the money available to cover this period and keep growing the business. Be realistic here. If finances are standing in your way, consider seeking out loans, activating a savings plan or just working at your business part time at first. There are ways to make your dream happen even if the cash isn’t available as quickly as you’d like it to be. Going into an at-home work venture without solid family support for the idea can prove to be a huge mistake. If family members do not understand that work time is important or that work calls shouldn’t be interrupted with blaring rock ‘n’ roll music from a teenager’s room, than an uphill battle will need to be fought. • Have I discussed the idea thoroughly with all family members? If you haven’t, you will want to do so. Making sure everyone who is old enough understands that just because you are home doesn’t mean that working hours are any less important is vital for your chances at success. • Will older family members provide backup during emergencies? Work at home moms still need to attend meetings, meet deadlines or get out and network. When the need for serious focus time presents, it is imperative to have someone who can step in and take care of childcare and/or household duties. • Will family members pitch in? Just because you’re working at home doesn’t mean you can or should handle everything. It will help you immensely if family members will pitch in with chores and do their part to make sure everything in the household flows smoothly.